Ding, ding! Toot, toot! A little electric locomotive keeps us centred as the tug boat pushes us into the locks. Two guys in a little rowboat handle the cables that connect us to the locomotive. Our ship flies a flag labelled 21 North, the number assigned to us as we transit the Panama Canal today. Yes, North is correct. If you think this fifty-mile shortcut linking the Pacific and Atlantic Oceans runs east-west, check your atlas! We are well-informed. A local Panama Canal commentator boards our ship at 7 a.m. and provides commentary throughout the day. Three lectures and two films were offered in the days leading up to the big event. Not surprisingly, Doug is fascinated by the engineering aspects, while Cathy’s areas of interest are the public health history (yellow fever, malaria) and the scenery (there are the vast tracks of jungle on both sides). We arrive one year after the canal’s 100-year anniversary and one year before the opening of the major expansion that widens and deepens the channels to accommodate bigger vessels and adds a third lane. If you like to watch excavation and dredging mega-projects in action, hurry on down to Panama. After that, head over to Nicaragua, where construction of a competing canal (price tag: fifty billion dollars) is just getting underway. It seemed like a good idea when we made the reservation seven months ago. As the day of the Segway Historic Tour approached, Cathy suffered some anxiety as to whether she could drive this new-fangled gadget. Thanks to patient instruction from guide Cesar, Cathy drove her Segway along the narrow streets of Old Town for ninety minutes without mishap. Doug, of course, found the Segway intuitive and fun. He would buy one, if they weren’t so expensive. Ten thousand dollars each is what Cesar paid for his fleet of Segways. The Ninebot One, a single-wheel personal transportation tool used by Cesar’s assistant Jahir, is less expensive, but it requires better balance that we have. 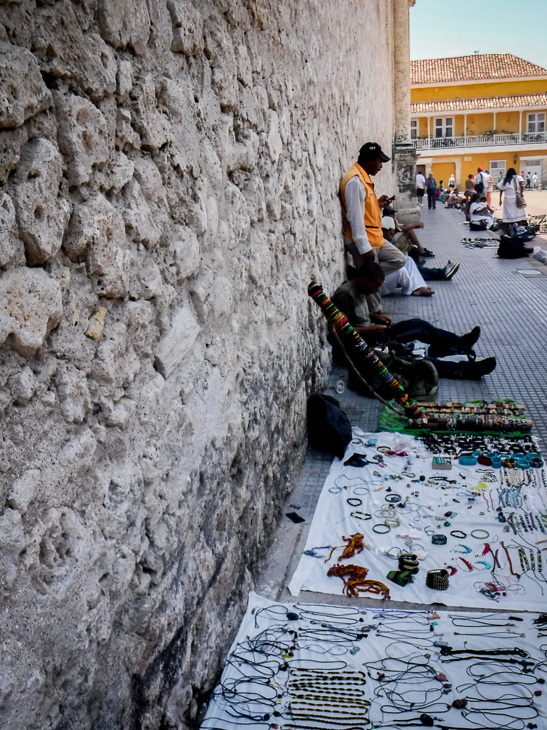 Cartagena’s Old Town is full of colonial churches, elegant buildings, little parks with tinkling fountains, wrought iron balconies crammed with pots of geraniums and bougainvillea, and bronze statues, such as the gigantic one of South America’s liberator, Simon Bolivar. The area is so historic – and so pretty – that it has been designated a UNESCO World Heritage Site. 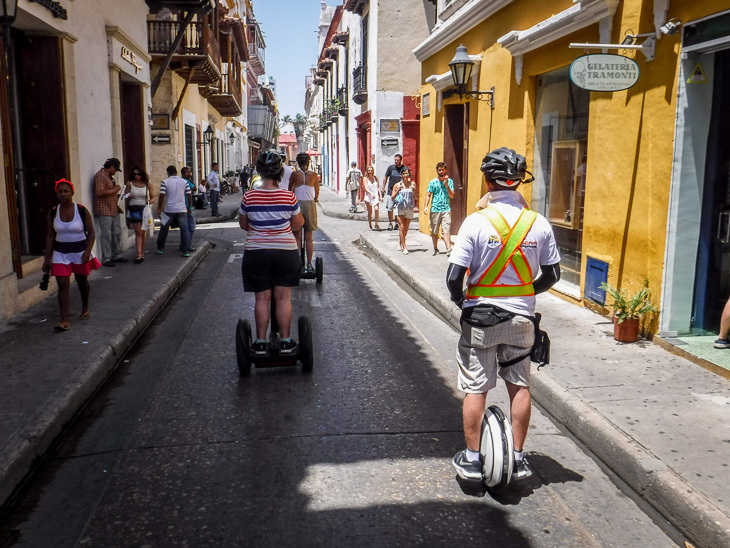 Segways are an easy, breezy way to tour a city that can be hot and humid on foot. 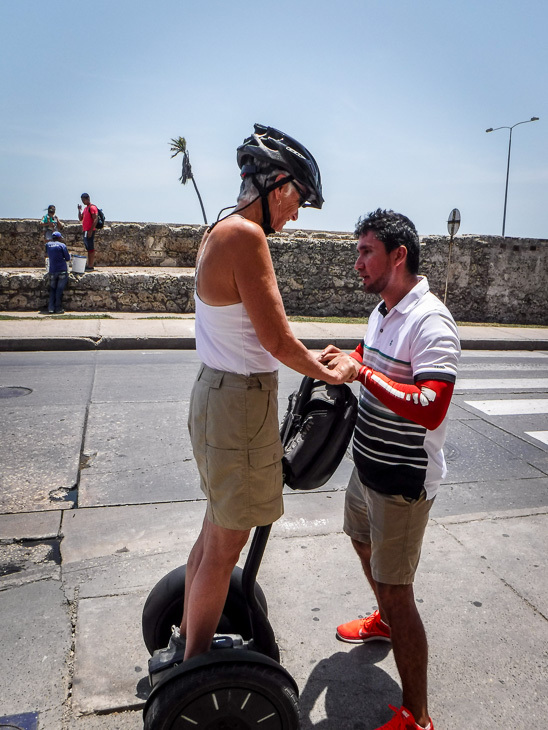 If you are coming to Cartagena, please check out Cesar’s tours at Segway Cartagena. Don’t miss the key lime pie-on-a-stick, we’d been told. Alas, that frozen treat, along with other colourful and funky attractions, had to be missed, because the captain cancelled our call to Key West. A tropical wave caused us to alter course across the Caribbean, bypassing Key West. What is a tropical wave? It’s a type of atmospheric trough which moves east to west, causing cloudiness, significant wave height, and thunderstorms and can lead to tropical cyclones or hurricanes. The crew dispensed seasickness tablets and barf bags and struggled to keep us entertained for three days of rough seas. Rescue at sea! 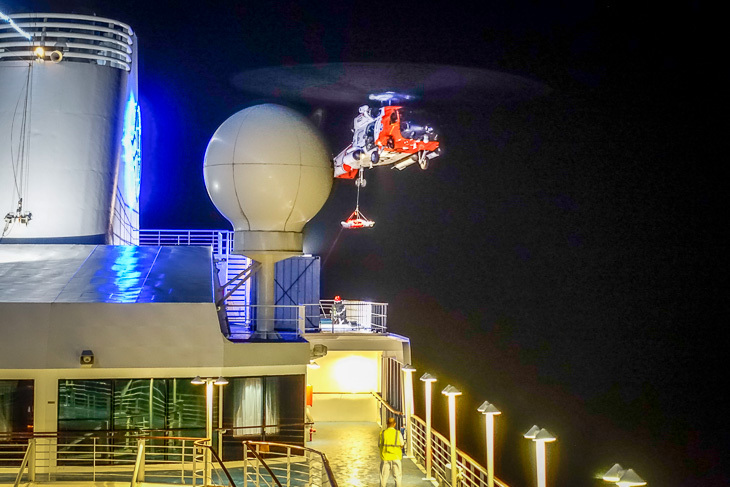 After a crew member suffered a heart attack, the Coast Guard swooped in with a helicopter for a dramatic night-time rescue. The captain altered course to minimize exposure to the storm-force winds. The helicopter hovered and dropped a basket. A few minutes later the striken patient was airlifted into the night sky and whisked away towards the nearest hospital. Cathy, who takes evaluation seriously, spent a full day completing the end-of-cruise questionnaire. Farewells were said and were sad, especially when saying goodbye to our room steward Khrystyna. Disembarkation took place with the usual chaos, but we survived that. At this moment we are in Toronto, awaiting our flight home to Victoria. Will we luxury-cruise again? Maybe when we are older. Right now, we are heading home to collect our sleeping bags, pfds, and some trail mix for our next adventure, which begins in just five days. We hope to see you out there – on the trail, on the water, or on the bike path. Thanks for reading and stay tuned. This entry was posted in Central America, Columbia, Cruise, Florida, Panama, South America, USA and tagged Cartagena, Key West, Miami, Panama Canal, Segway, tropical wave. Bookmark the permalink. Can I borrow your first 3 sentences? Wish I could borrow the next one! Sure, your welcome to borrow anything, even the next one. Just don’t give it back. Fantastic account of your adventure! Thanks so much for sharing it and the photos with those of us at home. Thanks David, and super thanks for looking after things while we were gone. We owe you! I’ve really enjoyed reading about your adventures, Cathy and Doug. Many memories for you and lots of wonderful photographs. Enjoy settling back in at home and getting back into your active life. Happy summer. See you when I return in October. We had fun doing the blog; it helped fill the “sea days”. See you when you return. Thanks for your Blog Cathy and Doug – have enjoyed it as we progress on our RV trip to Ottawa and back. Presently in Toronto visiting our son before crossing into US to take two weeks to drive home. Hope to see you both in the fall sometime. We are enjoying following your blog also. Say hi to Penny and Lucy.